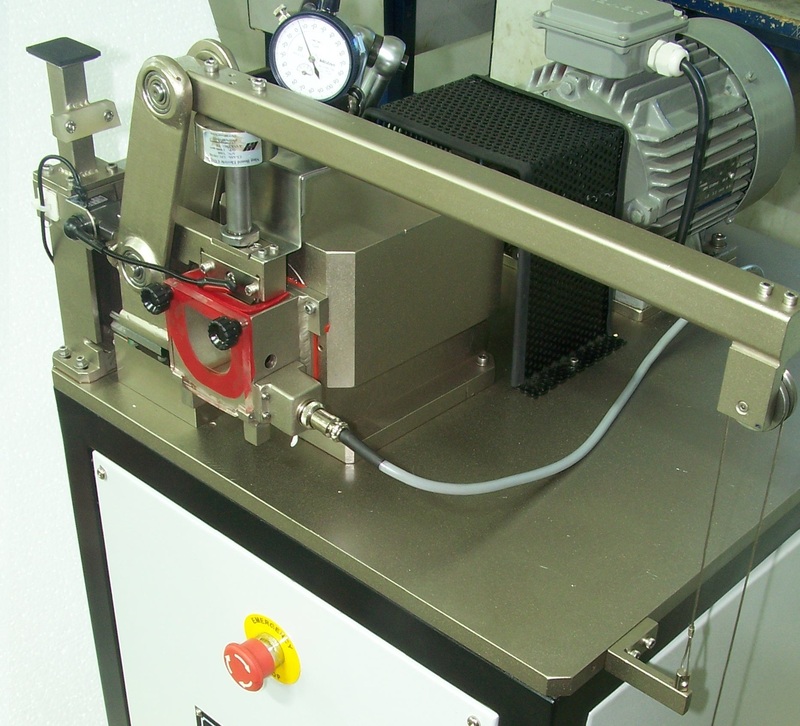 The Reichert Tester is a unique tool for lubricant and additives producers to test wear preventive (WP) and extreme pressure (EP) characteristics. The test is designed to determine the point of formation of a lubricating film between two test surfaces. The test starts as a sliding contact between the surfaces and progresses to being hydrodynamically lubricated due to the formation of a lubricating film between the surfaces. This change is a result of the contact geometry progressing from a point contact to an area contact. The test is unique as the the formation of a lubricant film is primarily identified by a sudden drop (10 db ) in the screeching sound arising out of an unlubricated metal to metal contact. As soon as the area increases sufficiently (and thereby a reduction in contact pressure), a fluid film forms and separates the surfaces causing a drop in the screeching sound. The Reichert Tester by Ducom detects this drop using an acoustic sensor and electronics designed to detect the acoustic drop and cease the test for accurate scar measurements. The system requires a small amount of lubricant for each test and can test both oils and greases. It uses a pin and a friction wheel as specimens. The area of wear scar on the test pin is measured in order to calculate the load carrying capacity of the lubricant. Lubricants form an important part of most mechanical systems. The right lubricant can enhance system life, enhance efficiency, cool and remove debris. Lubrication is an interesting and an innovative field where the choice of an appropriate lubricating media is made based on the application. The term lubricant brings to mind oils and greases. These are the most popular lubricating media in use currently. However, many applications now use solid lubricants like Graphite, Molybdenum Di Sulfide (MoS2), Boron Nitride and Polytetrafluroethylene (PTFE) where use of oils and greases is not desirable. There are more instruments for lube evaluation which I will cover in future posts. I get this question all the time! Most people have no idea about what the word “Tribology” means. When I ask them to guess I get some very interesting replies – but the most frequent one is” Study of Tribes”. Well, here is what tribology is – it is the study of wear, friction and lubrication. When any two surfaces are in contact with each other and are in relative motion you will encounter varying degrees of wear on the surfaces and friction. The study of this is called tribology. Lubricants are studied as the media used to influence the degree of wear and friction during these tribological interactions. So, whats the big deal about all of this? Think of it this way – almost anything that you see around you has tribology in action! Your shoe against the ground, hinge on a door, feeling of smoothness when you have lotion on your skin or a shaving blade that is being lubricated by shaving cream, engine of your car, and the list goes on… All of these examples have at least two surfaces interacting and many have a lubricant to moderate the interaction. Tribological consequences in some of these cases is quite severe – imagine a bad shaving cream. OUCH! Now, imagine a bad lubricating oil for an engine – that is an “OUCH” for the car. Having good lubricants and well designed surfaces can help in having fuel efficient and longer lasting systems. Research and developments in Tribology contribute significantly towards keeping our planet green and keeping many other systems (including our biological systems like knee joints, hip joints, etc…) healthy and sustainable. This is my first post on the Tribology Blog – a blog I have started to share with you all things that are connected to Tribology. To spread the word, share knowledge and to get more people interested in the field. I welcome your ideas about things that you think are interesting and would like to see covered on this blog, about interesting research going on in the field, new developments and also questions!